Russian sage is a low-maintenance, drought-tolerant shrub, making it a great choice for xeriscaping. Its long blooming period is valued by those who seek a flower bed that remains in bloom throughout the growing season. This bush produces panicles of small, bluish-lavender flowers throughout the summer. Not to be outdone by its flowers, the plant's stems and foliage make a strong statement of their own, perhaps even outstripping the floral display as the chief reason to grow the bush. A graceful perennial with silver stems (so chalky in appearance they sometimes seem to be white) and feathery, silvery leaves, Russian sage plants can reach a height of 4 feet (with a spread of 3 feet) or greater if you do not prune them annually. Russian sage is a tough plant that needs little care. Being tall, it does often require support (either staking or a peony ring) if grown individually, lest it flop over. If grown in masses, they more or less support one another. But the primary care concern with these plants is pruning, which is optional. As a member of the mint family, the Russian sage spreads by runners and needs to be monitored to remove them from places you don't want it to spread. Pull up suckers in the early spring. Divide the plants every four to six years to refresh them. 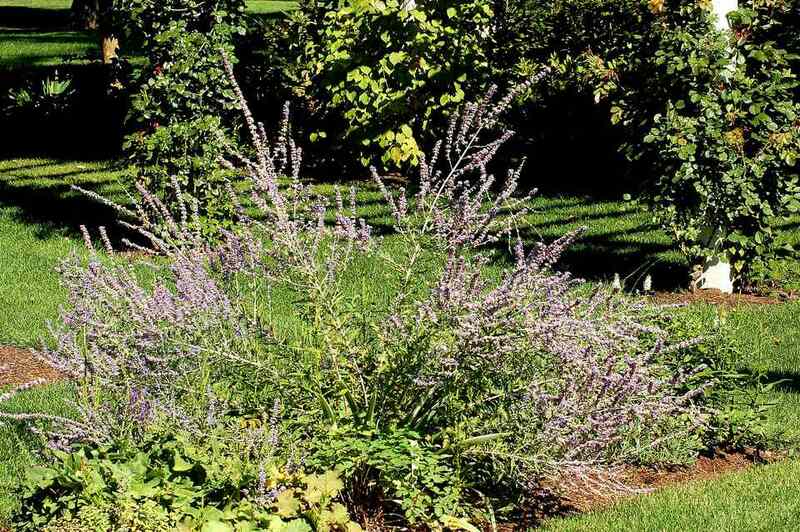 Russian sage has fragrant foliage and attracts hummingbirds, honey bees, and butterflies. Like many aromatic plants, they are also deer-resistant, and rabbits are unlikely to eat them. Its fine texture makes Russian sage a good choice if you're seeking contrast with plants exhibiting a coarser texture. Perovskia atriplicifolia is used en masse in border plantings and rock gardens. If not overpowered by plants with larger, showier flowers, it can serve as a specimen plant. In addition, given their height and their long-blooming nature, Russian sage can be an excellent choice for the back row of a flower bed. For best results and blooms, plant Russian sage in full sun. These bushes thrive in well-drained ground but will tolerate clay soil. They prefer alkaline soils of pH 7 and greater but can tolerate a wide range of soil pH. New transplants need regular watering, but once established Russian sage is very drought-tolerant. It likes medium to dry soil and will do fine in hot, dry areas of your yard or garden. Indigenous to central Asia, Perovskia atriplicifolia can be grown in planting zones 5 through 9 and may survive winter in zone 4 if you provide some protection. This plant does well in poor soils. At most, you might provide a light layer of compost in the spring. Perovskia "Filagran"’ has finely-cut leaves and an airy appearance. Perovskia "Longin" is more rigidly upright and narrower and has slightly larger leaves. Perovskia "Little Spire" is a dwarf variety which matures at about 1.5 to 2 feet tall, with a similar spread. Some gardeners choose to prune Russian sage annually. The argument for pruning is that the plant will grow to be bushier as a result of this care. At the very least, it's a good idea to cut off any dead branches to keep this perennial tidy. The normal time to prune Russian sage is early spring or mid-spring, depending on the strategy you adopt. One reason why spring is the best time to prune (as opposed to trimming in fall) is that leaving the silver branches adds interest to the winter landscape. Another is that if you trim in the fall and don't get a hard freeze the plant could start producing new growth. At that point, a hard freeze could kill the new growth. There are two basic trimming strategies: One is to prune down to within a few inches of ground level in early spring and just be done with it. Another approach is to wait until mid-spring and allow the plant stems to start to fill in with leaves. You'll be able to identify the dead stems this way as the ones that aren't filling in, and you can proceed to cut them off. Then, make a judgment regarding the remaining branches. For example, if you want to start out with stems that are 1 foot tall, make your cut at 1 foot. The taller the plant starts out in spring, the taller it will end up in fall.